McCaskill's campaign appears to be doubling down on that message in the campaign's final days. In a new television ad released Tuesday by McCaskill's campaign, featuring veterans who support McCaskill, one man says of the incumbent senator, "you don't have to like her," before pushing back on Republican lines of attack and praising her work in the Senate. The radio ad takes that message a step further, however, attempting to differentiate McCaskill from unnamed "crazy Democrats." The ad features two middle-aged men discussing the Senate race between McCaskill and state Attorney General Josh Hawley, a Republican...The men [discuss] McCaskill, with one conceding, "I don't always agree with Claire McCaskill. But she works hard, fighting against those tariffs, doing all those town halls," the man adds. "Claire's not afraid to stand up against her own party." "Yep," the second man chimes in, "and Claire's not one of those crazy Democrats. She works right in the middle and finds compromise." State Sen. Maria Chappelle-Nadal, a Democrat whose district includes Ferguson, told CNN she believes the ad could refer to African-American voters in the state's cities, among other subsets of the Democratic base. 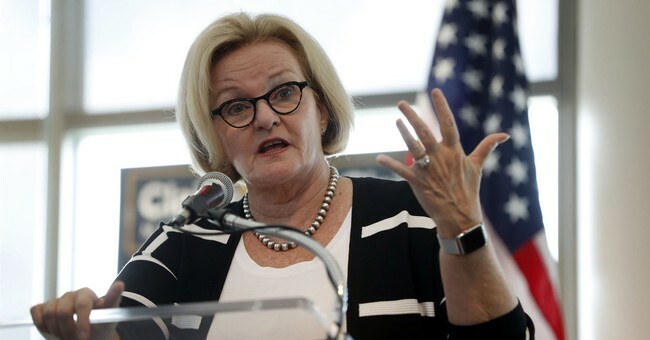 McCaskill "is calling her base in the urban areas crazy Democrats," Chappelle-Nadal said, "and she's relying on those so-called crazy Democrats to make sure she wins." McCaskill last year called on Chappelle-Nadal to resign after she expressed hope that Trump would be assassinated. Chappelle-Nadal later removed the post and apologized but refused to step down. Chappelle-Nadal decided previously that she plans to write in a candidate rather than vote for McCaskill, who Chappelle-Nadal says has been "very disappointing." The sheer number of Democrats in that state will likely overwhelm Hugin's enthusiasm advantage, but the last thing Democrats need is for an incumbent in a solidly blue state limping toward a close finish.